As I sketched out a rough itinerary for our long weekend in gluten-free Atlanta, I quickly realized that the sensational Southeastern food scene my husband and I had been hearing about was no exaggeration. In fact, so many Atlanta-area restaurants, cafés, food halls and bakeries had caught my eye that we would easily have enough to eat to last us for a couple of weeks or longer. Paring down my culinary wish list wasn’t easy, but ultimately we were thrilled with everything we tried. Get a taste of our favorite gluten-free spots in Atlanta and find out how we explored the city between meals. 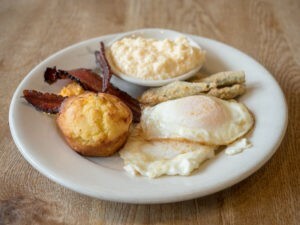 After arriving in Atlanta, seeking out gluten-free versions of Southern classics was at the top of my to-do list. I’d heard that Bantam + Biddy was a must, and this modern Southern diner didn’t disappoint. While not every menu item at Bantam + Biddy is gluten free, all safe options are clearly marked on the menu. All fried items here are gluten free. That means you can try everything from the fried chicken tenders to the fried green tomatoes. I ordered both, of course. With their crunchy cornmeal coating and tender interiors, the fried green tomatoes made for a fantastic appetizer. They were particularly tasty when paired with the rich whipped goat cheese. Juicy and well-seasoned, Bantam + Biddy’s chicken tenders hit the spot both with and without the zesty wasabi honey dipping sauce. We opted for the Southern breakfast. The huge plate is loaded with three farm eggs and all the fabulous fixings—creamy grits, pimento cheese, fried okra, crispy bacon and jalapeño cornbread. The menu is filled with mouthwatering savory breakfasts like the big chicken skillet and sweet options like the buttermilk pancakes. With so many options, you can’t go wrong with gluten-free breakfast or lunch here. an appetite for another meal. Naturally, more Southern fare awaited in Midtown. Today, South City Kitchen has four locations in the metro Atlanta area, and all offer numerous gluten-free dishes and modifications. I recommend starting with the pimento cheese, which arrives in a generous portion that’s more than large enough to share. The bread-and-butter pickles and fresh veggies were just right for scooping up the zesty cheese and perfectly complemented the rich flavor. Starting with this dish was also the ideal way to prime our palates for the shrimp and Geechie Boy grits. Executive Chef John Spotkill makes the signature grits dish with a rice flour-based roux, a smoky tomato and poblano gravy, sautéed shrimp and tasso ham. 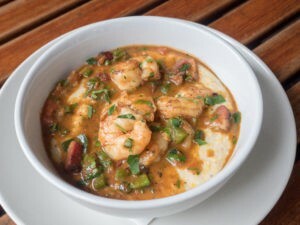 As a longtime lover of shrimp and grits, I’m already dreaming up plans to return to South City Kitchen to sample this dish again. As much as I enjoyed digging into Atlanta’s Southern food scene, I also fell head over heels for some of the city’s Mediterranean and Southeast Asian spots. In fact, no trip to Atlanta is complete without a meal at Mediterranea, the city’s only completely gluten-free restaurant. 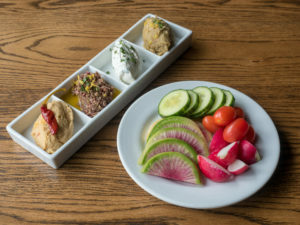 Here, co-owners Gerard Nudo, a pastry chef, and Gary McElroy, who has celiac, have joined with Executive Chef Anthony Galletta to design a gorgeous space that specializes in Mediterranean-inspired fare so delectable that it appeals to everyone, gluten free or not. Nestled in Atlanta’s charming Grant Park neighborhood, Mediterranea highlights fresh, creative ingredients with a healthy emphasis on hearty plant-based dishes. I couldn’t get enough of the quartet of spreads. And I used the crudité and freshly baked focaccia to scoop up every last bit of the flavorful chickpea, labne, eggplant and artichoke olive spreads. 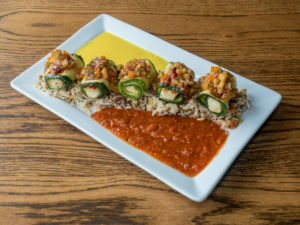 I found the involtini to be a standout dish and a fun take on a Mediterranean classic, featuring thinly sliced zucchini wrapped around savory halloumi cheese, topped with a deconstructed ratatouille, and accented by colorful tomato sauce and yellow pepper coulis. 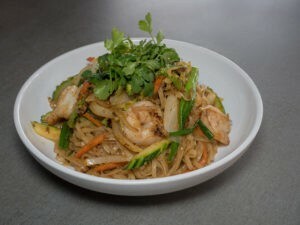 I’d also recommend trying the Calabrese shrimp and orzo. It packs a flavorful punch with a spicy tomato-based sauce, salty feta cheese and sweet golden raisins. If you have as much of a sweet tooth as I do, you’ll appreciate the pastry case, which features a rotating selection of morning glory muffins, cherry pecan scones and the divine lemon Bundt cake that I sampled. If you’re in the mood for something sweet, note that while baked goods are available any time the restaurant is open, you’ll find the best pastry selection on weekends, when Mediterranea also serves scrumptious brunch dishes like buckwheat crêpes with smoked trout and black cherry cream cheese French toast. Work off your meal at Mediterranea with a stroll through nearby Grant Park or a wander through Atlanta’s lively Poncey-Highland neighborhood. The latter is home to Ponce City Market, one of the most impressive and expansive food halls I’ve ever visited. While I merely window-shopped, I was excited to sample the fare at CO, located just up the street. At this bright, airy Poncey-Highland spot, Chef Masanori Shiraishi (aka Chef Masa) puts a contemporary twist on classic Thai, Vietnamese and Japanese dishes, many of which you can request gluten free. I recommend starting with the mango summer rolls, which are light, fresh and ideal for warm weather in Atlanta. You can’t go wrong with CO’s fusion sushi rolls. And as a noodle fan, I loved the Hanoi Noodle, which comes with rice noodles, crunchy cabbage and carrots, and a spicy yellow curry sauce. Since CO now has branches in several Southeastern cities, I’ll be adding the other locations to my list for future trips, too. Normally when I travel, I focus on getting to know the city itself. This leaves very little time for exploring the further reaches of the metro area. When I mapped out our Atlanta trip, however, I realized that all of the city’s gluten-free bakeries are located on the outskirts. Since I couldn’t leave without sampling a couple, we set aside plenty of time to visit two tasty spots just north of the city. Our sunny Saturday morning started at Gluten Free Cutie. 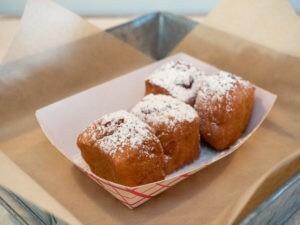 The chalkboard menu tempted us with the promise of beignets. The farmhouse chic decor invited us to relax and stay awhile. Although I’d been planning to focus on the sweets, I was delighted to find that Gluten Free Cutie had a lengthy weekend breakfast menu packed with savory goodies. The cheddar biscuit with fried green tomato and bacon made for a delicious weekend breakfast, but the real stars of the show were the beignets with raspberry sauce. The Gluten Free Cutie team makes and fills these babies to order, ensuring that they’re piping hot and the perfect doughy texture. While these sweet treats already made the trip north worthwhile, we had much more to try. Next, we headed over to Sally’s Gluten Free Bakery in Sandy Springs. One of the first gluten-free bakeries to open in the Atlanta area, Sally’s opened in 2009. It has been baking up an impressive array of breads, muffins, cakes, cookies and pies ever since. Owner Taylor Owings emphasizes freshly baked grab-and-go goodies that appeal to everyone, and many items are free of soy, dairy or eggs in addition to gluten. I found Sally’s chocolate chip cookies totally irresistible. 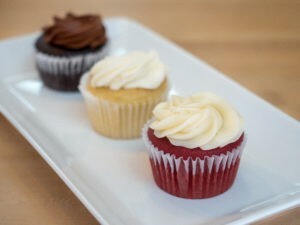 Not to be forgotten, the vanilla cupcakes are wonderfully sweet. And the banana bread is delicious for breakfast or dessert. I also loved the bestselling C.R.A.W. bread, a hearty loaf that’s packed with raisins and walnuts and is perfect toasted. I had unreasonably high hopes for Atlanta’s gluten-free food scene, but the city still managed to exceed my expectations completely. From grab-and-go treats to fine dining and everything in between, Atlanta truly has it all for gluten-free diners. I can’t wait to plan a longer return trip with ample time to sample even more of Atlanta’s gluten-free specialties. Travel Editor Anna Sonnenberg is a food and travel writer. She has journeyed around the world gluten free since being diagnosed with celiac in 2012.